PAGASA is invited to a meeting in Congress on 27 bills concerned with amendments for the Consumer Act of the Phils. 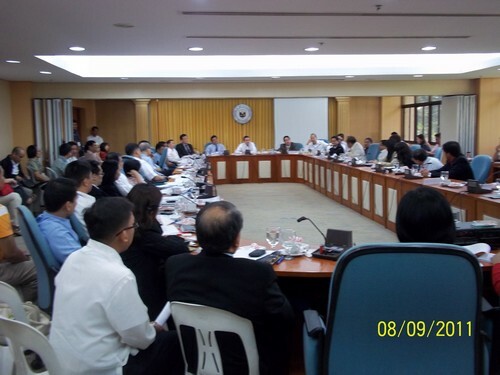 It is chaired by the Committee on Trade & Industry under Rep. Albert S. Garcia (in white under the Seal of the House of Representatives) and joined by at least ten other Congressmen. Other Sponsors of Bills included Reps. Rufus Rodriguez, Arthur Yap and Diosdado Macapagal-Arroyo on topics ranging from food safety, labeling, profiteering, credit cards/prepaid cards, toy safety, timbangan ng bayan, economy airline charges to Trans Fat in food.